Available Now - Manuals, CD's and USB's are estimated to be available early April. 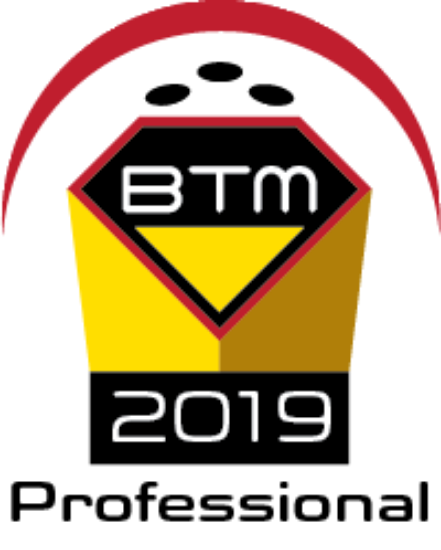 BTM-2019 Professional promotes the best tournament software using CDE Software's experience with bowling software to provide the sport of bowling with the best in tournament management. Not only is it the best tournament management software available, it is the easiest to use. Eliminator Events - Qualifying squads cut to X for next round, cut to X for next round, etc. Any combination of event types as needed. Why be limited on number of event types up to event limit? Built-in Bracket Module to manage bracket sidepots. Dedicated Support - CDE provides the largest opportunity for support for your program via online chat, message boards, email, fax, mail or phone. Windows 10 (1507 Original, 1511 November Update, 1607 Anniversary Update, 1703 Creators Update, 1709 Fall Creators Update, 1803 April 2018 Update, 1809 October 2018 Update). Optical Drive: CD-ROM or DVD-ROM Drive 4x or faster (compatible with reading CD-R's) - Not needed if installation via download. USB 1.1 or USB 2.0 compatible port if installing from USB Flash Drive. This edition does not integrate with electronic automatic scoring systems. The A/S (AutoScoring) edition is the only edition that integrates with the electronic scoring systems to export rosters to the lanes and import scores after bowling.